Marvo has the honor of offering for purchase a very limited edition of 24 bronze statuettes of Paul Kroegel created by the late artist Rosalee Hume in the 1990s. 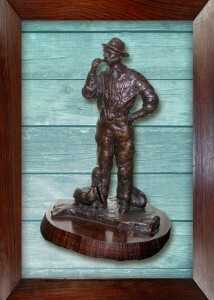 This nine-inch-tall sculpture is identical to the life-size statue that stands in Riverside Park in Sebastian, Florida, near Kroegel’s home. Each statue is accompanied by a certificate of authenticity signed by Ellen Schmidt, Ms. Hume’s daughter. In 1999 one of these miniatures had the distinction of being selected to hang on the White House Christmas Tree.